Dave Tomlinson's book How to Be a Bad Christian was written for all those who want God without the guff - revealing that being a 'bad' Christian is perfectly good enough, and that it's possible to ditch religion without losing the faith. 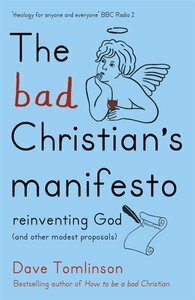 The Bad Christian's Manifesto continues the conversation, unpacking what spiritual intelligence - from an unapologetically Christian viewpoint - might look like for all the self-confessed bad Christians of the world. Join Dave as he explores how to befriend your inner sceptic, make a virtue of pleasure and find heaven in the ordinary things of life. About "The Bad Christian's Manifesto"
Dave Tomlinson is the vicar of St. Luke's Church, Holloway, in North London, and former leader of Holy Joe's, an unconventional church group that meets in a London pub. He's a popular writer and speaker and holds a masters degree in Biblical Interpretation. Dave is married to Pat, and together they have three grown-up children and two grandchildren.